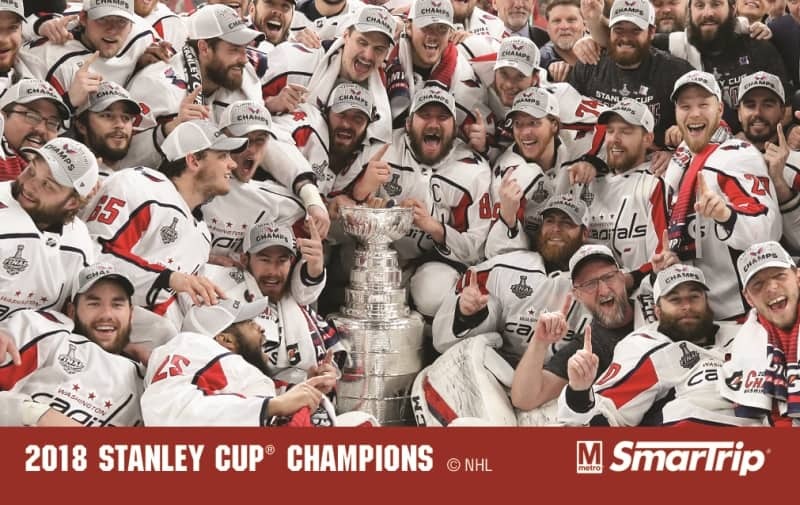 Metro is honoring the Washington Capitals with a limited-edition commemorative SmarTrip card for winning the Stanley Cup, the first in the Caps’ 44-year history. Following the Caps’ Game 4 victory, Metro committed to the Caps and right wing T.J. Oshie – who along with defenseman Matt Niskanen rode Metro to both home games in the Stanley Cup finals – that Metro would issue a commemorative Capitals card if the team brought home the Stanley Cup. Usually reserved for Presidential Inaugurations and other events of national significance, this is the first time a commemorative SmarTrip card has marked the occasion of a DC sports championship. Metro and the popular new-media Capitals website ” Russian Machine Never Breaks” submitted several designs for approval. Today, Metro obtained permission from the Capitals organization, as well as the National Hockey League, to produce cards using a photo of the Capitals and the Stanley Cup on the ice immediately after their historic Game 5 victory. The cards will be sold for the standard $10- $8 in Metro fare value plus $2 for the cost of the card. Metro’s SmarTrip card manufacturer will begin production of the limited-edition cards immediately, with order fulfillment taking place over the next several weeks. Fans purchasing the cards, which are only available online, are being asked to allow a few weeks for home delivery.